For every favorite Korean dish, we all have our personal non-favorites. For one of my best friends, he hates nengmeyon as he explained to a flabbergasted, nengmyeon-loving me, "How can you eat noodles cold? And why are the noodles so chewy?" A borderline heretical opinion if there ever was one! 3. Or in a spicy stir fry with other veggies and goods called soondae bokkeum (순대볶음). The last one, soondae bokkeum, is famous in Seoul's Sillim region where there's an entire street of restaurants that all serves this dish. Among these, the two most commonly seen versions of soondae are the snack types, like the ones many ddeokbokki places serve- which contain less animal and more noodles and edible casing- while the other is the traditional blood sausage which is made with real pig intestines, various fillings and pork blood. The latter type has different varieties based on Korea's different regions which mostly differs on what goes into the filling. But in an age where such traditional, "rustic" Korean dishes of the past are eschewed by the younger crowd, it's not easy to find many soondae places, especially ones that serve the "real" stuffed sausages, that caters to the under 30's crowd. Which is exactly why the popularity of Soondae Shillok, the subject of today's post, in Daehakno (one of Seoul's premier meccas for the 10s-20s crowd) is almost an oxymoron in itself. For those who are unfamiliar with the area, Daehakno is one of Seoul's most representative "college hoods" with universities such as Sunkyunkwan University and Hansung University all located nearby. As such, the makeup of the area is mostly those in their late teens to early twenties who gather in crowds to grab bites of cheap eats, watch plays and performances in the many independent theaters in the area, and/or grab a few cheap drinks. As is the makeup of many such areas frequented by the younger crowd, the eateries around these parts tend to reflect the tastes of what's in with Korea's youth today such as pasta restaurants, spicy stir-fries, cheap barbecue joints and more. But soondae? Soondae is "old soul" food. It's the dish Korean moms buy in their neighborhoods while shopping in the traditional market. It's the dish fathers enjoy with their friends over soju and even as a steaming bowl of soup the next morning as a hangover dish. But during my last visit to Daehakno, while figuring out what to eat before catching a play, a search on popular eating joints in Daehakno produced pages and pages of blog reviews by locals all raving about Soondae Shillok. Even more astounding was many experiences stating not only the place was packed during visits but some even had to wait in line. Waiting... in line. For soondae. From my research, Soondae Sillok has been around for over 10 years in the same spot and was already popular with the locals but a recent string of appearances on a few TV shows took Soondae Sillok's popularity to new heights with particular buzz around its 'youth' soondae. I went with a friend at an early dinner time during a weeknight and found the place quite packed but luckily no wait time. The weather was quite good so we chose to seat in the outside patio but the establishment is large and has many seats inside as well. The traditional chapssal (sticky rice-stuffed) soondae (전통 찹쌀순대) comes in three sizes (6,000 for half; 12,000 small; and 20,000 for large respectively) which can also be ordered with other boiled head meat in their 'everything soondae' or '모듬 순대 (18,000 for a medium size and 25,000 for a large). Just the boiled meat, or 'sooyook' (수육) is also 18,000 for a medium and 25,000 for a large. The soondae can also be made into a spicy stir fry (순대철판볶음), just like the famed dish found in Sillim, or in a stew or jeongol (순대전골). Both dishes are 25,000 each. The soondae soup (순대국밥) is 7,000 for the regular and 9,000 for the special which includes the boiled and sliced headmeat. The famed soondae steak, which is labeled as 'youth soondae' (젊은순대) is 14,000. Side dishes are kept to a minimum but are your quintessential sides for any soondae shop including lightly dressed and mixed chives, kkakdoogi, ssamjang, and a few onion pieces and chili peppers. If you want more of the side dishes, inside the restaurant is a self-serve bar where one can stock up on more of the sides to his/her heart's content. Also provided at every table are salt and pepper as well as containers containing wild ground perilla seeds and shrimp jeot gal (salted baby shrimp) for soup seasoning. Soondae shillok gets both of these latter ingredients from a special producer and prides itself on their high quality. But Soondae Shillok takes greatest pride in the preparation and dedication that goes into its soondae. Traditional soondae is heavy on the blood and pig parts, which has its die-hard fans, but for most younger crowds the gamy smell and dark color from the pig blood can be off-putting. Even I don't go out of my way to go get a plate of soondae. Here, however, the soondae has been revamped to include some 20 different vegetables in the stuffing for a healthier twist and goes light on the pig blood- which is never more than 24 hours old. They also forego putting in congealed blood- usually a main ingredient of traditional soondae. The result is a lighter colored soondae which is left to mature in a fridge before cooking/eating. Before serving, the soondae isn't boiled in simple water but a special in-house made broth which also takes some 14+ hours of simmering to make. With such extra attention and effort put into target the tastes and preferences of the younger age base, I was curious to know- was the soondae from Soondae Shillok a revolutionary take on this centuries-old Korean favorite or a mere fad risen to prominence mostly on talk and buzz? It was time to find out and on our visit, we went with the standard soondae gukbap (soondae soup) and the much hyped soondae steak. The soondae gukbap comes in a milky-white broth tinged with just a bit of red from the spicy seasonings. The soup comes full boiling, providing glimpses of some of the meat and soondae inside as well as some of the greens from the perilla leaves and green onions. When eating soondae guk, you add the salted shrimp, ground perilla seeds, chives, and other seasonings to your liking and most like to dump their bowl of rice right into the steaming hot soup for easier eating. Unlike most soondae gukbap I've had, the soup had a very clean and tidy taste to it with just a slight hint of spice that was subtle. While much lighter than other soondae gukbaps, the broth was in no way two-dimensional and I could tell the broth had been simmered and boiled for a long period to draw out the depth and volume of the broth. The pieces of meat and chopped soondae were ample and I was glad they hadn't been over boiled to an excessively chewy state. True to the descriptions, the soondae was much lighter in color with a clear visual on the glass noodles, meat, and veggies that made up the stuffing. Despite the lighter looks, like the broth, the soondae was more complex then it looked. I didn't find the soondae extraordinary but it definitely was less meaty and gamy in taste than traditional soondae. Everyone has their preference in what they eat soondae with. In Seoul and most northern parts soondae is commonly eaten with a simple dip in salt and seasonings. Down south, however, the preference goes for either adding a bit of the salty shrimp on top or dipping it in ssamjang. I enjoyed mine wrapped with the chives side dish. The soondae steak is grilled to order inside the restaurant on a big metal pan. The result of the pan cooking is a soondae which has a wonderfully snappy exterior and yet a soft and moist stuffing. Curled about itself, the soondae steak is served with a simple water parsley (미나리) salad on the side, sweet and sour sauce for dipping and a tong and knife for cutting the steak. The water parsley salad is dressed in a Korean-style dressing consisting of soy sauce, red chili flakes, sesame oil and such. The subtle fragrance from the water parsley paired well with the meaty soondae but I wasn't a fan of the heavy use of fish sauce in the dressing which overpowered the water parsley's subtle flavors. I ended up continuing to eat the soondae with the chives side dish rather than the water parsley salad. The soondae's crisp exterior made cutting easier and revealed the colorful stuffing inside. Minced onion, leek, and other ingredients provided a kaleidoscope of colors and certainly provided the most enticing looking soondae I had ever seen. Initially I was a bit puzzled as to why the sweet chili sauce was chosen as the dipping sauce but after trying it out I understood the pairing. The soondae steak, true to the reviews, is a much lighter soondae that's more akin to the bratwurst kinds of sausages from the West. With congealed blood ('seonji' or 선지) noticeably absent from the soondae's makeup here, the soondae is more a far-off extended cousin of the sausage family and the soondae steak could just have easily been enjoyed in a bun with ketchup and mustard and I'm certain few would note the difference. As I stated at the beginning of this post I'm not a big fan of soondae in general. But as I noted on my visit to Soondae Shillok, the soondae here is a very light version of soondae which shares more commonalities with sausages than soondae. By including more spices and vegetables as the filling and using very little blood in the soondae's creation and cooking process, the result is a tidied offshoot of the traditional Korean soondae. For foreigners, kids or even Koreans who aren't major fans of traditional soondae in general, Soondae Shillok is a great way to provide an introduction to soondae as it's easy on the visual and taste. But soondae fanatics may find the soondae here a bit lacking as in the case of my friend who is a major soondae lover. Everything tasted fine, he said, but the refined and "cleaner" nature of the soondae at Soondae Shillok left something amiss for him and craving the more "primal" taste of regular soondae. So I guess it boils down to a matter of whether you're a "traditionalist" or a "progressive" regarding all things soondae. Many Western food also frequently become embroiled in impassioned debate over everything from the cooking process to ingredients for things as beloved as chili or pizza, and the beloved soondae, it seems, is no exception to arguments and controversy. A lot of care and effort is obviously made to make soondae dishes that appeal to a younger demographic. For soondae newbies, especially ones who possess more of a fondness for sausages, Soondae Shillok is a great way to be introduced to the popular Korean dish. But for veteran soondae aficionado, the cleaner, "refined" makeup and taste of the soondae here may generate less enthusiasm. 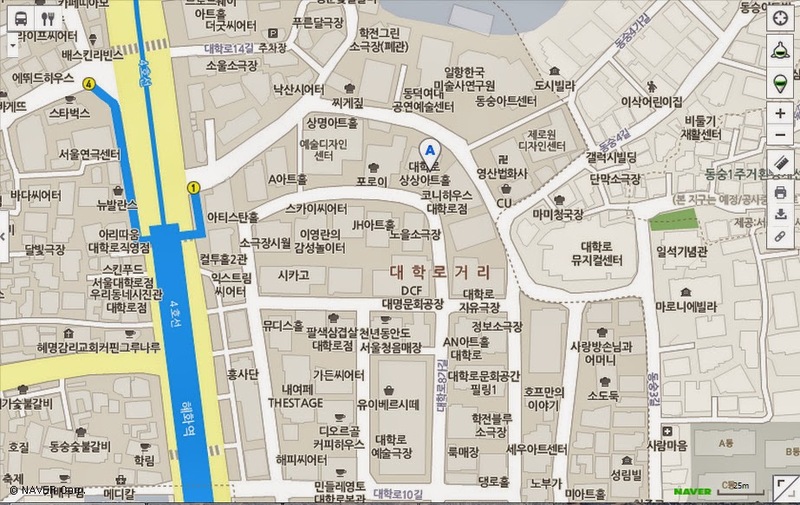 Come out of exit 1 of Hyehwa station and follow the big street immediately to your right. Walk about 70 meters and the street will split into two. Follow the split to your right. Walk another 70 meters or so and you'll see Soondae Shillok on your right, across the street from Dongsoongah Art Center. Parking: There's about three (yes, three) spots available in the front which, as you can imagine, fills up quick. Parking in Daehakno is inconvenient anyways so I'd recommend leaving behind any vehicles and using public transportation. Alcohol: Makgeolli, soju, bottled and draft beer available. You can download a coupon to get either a free half order of soondae or two draft beers with the purchase of any item off the menu. I only found out about this after my visit, doh! There's certain restrictions for the coupon such as only being able to use the coupon the day you download it and such and it may or may not work on weekends. But the link to download the coupon can be found here. Also, if you're a big fan of the soondae, and particularly find Soondae Shillok to your liking, you can search them up on Kakaotalk as a plus friend. Their ID is '순대왕'. From what I've read, if you become friends with Soondae Shillok you can make reservations via Kakaotalk and get treated occasionally to coupons, events, and other freebies.